A couple of weeks ago, I wrote a post about chronic migraines and pregnancy in which I expressed my hopes that my migraines would get better as I entered the second trimester. So far, those hopes have not been realized. In fact, my migraines have been worse in the past two weeks than over the past two months combined. And, it seems I’m not alone. Many of the pregnant women on the Whattoexpect.com forums who are (like me) due in October report suffering from debilitating migraines. Often reported statistics indicate that 50 to 90% of women with migraines experience an improvement in their migraine frequency and pain levels during the second and third trimesters of pregnancy. Apparently, neither I nor the other women in my forum group are included in this majority. 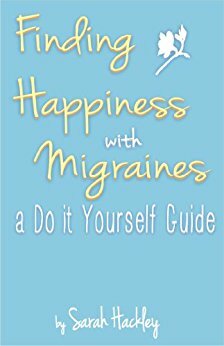 I have not had the chance to ask the other women who are reporting problems if they suffer from migraine with or without aura. Evidence seems to suggest that women without aura tend to do better in pregnancy than women with aura. Based on this findings, I (a chronic migraineur with aura) had expected to see little to no improvement in my condition over the course of my pregnancy. But, of course, that didn’t keep me from hoping. Now that I’m in the fourth month of pregnancy and the early part of my second trimester, that hope is starting to wane. Known as the “planning trimester,” months four through six are supposed to be the best months of pregnancy. The months in which you have the most energy and can really prepare for the baby’s arrival. The months in which you finish up any outstanding projects (like the book I’m supposed to be writing and the thesis that’s due in just a few weeks). The second trimester is when you’re supposed to do all the prepping and planning that you were too sick to do in the first trimester and that you’ll be too tired and too big to do in the third. While I have managed to put together our baby registry and figure out what baby proofing items we need to buy from my bed, I certainly don’t feel up to finishing my projects, renewing my exercise routine, or preparing a nursery. (Heck, I can’t even clean my bathroom, despite that fact that every venture beyond the bathroom door leaves me in a slight state of disgust.) In short, I’m so tired and suffering from so much pain that most days all I want to do is bang my head against the wall, sleep, and cry. To the other women out there who are suffering from the same thing: my heart goes out to you. Hopefully, better weeks and months are yet to come. For now, I’ll be crossing my fingers and hoping that the energy boost I’ve been promised will come by month five at the latest. Really enjoying your blog so keep posting please, I also have migraine with aura so can empathise with how debilitating it is. After 7 yrs of trying meds I am now having botox injections – they’re not much fun either! I read with interest the career changes you made, as I am greatly concerned I may have to do this one day… Good luck with your pregnancy re: your migraine toolkit can you still take motilium when pregnant for sickness? I’ve never heard of motilium. I believe my ob said it was okay to take promethazine occasionally, but I find the nausea much easier to handle than the visual disturbances and the migraine pain, so I typically don’t treat it. Only if I end up vomiting. My neurologist recommended Botox for me, but I can’t do that while pregnant, so I’ll have to wait and decide if I want to try that later. Are you having any luck with the treatment? I’ve always suffered from migraines but they have gotten so much worse since I’ve been pregnant. I get 1-2 attacks a week and have had a few trips to the ER. My attacks come with vomiting which is also my reaction to pain. I’m in my 4th month and have found no change since entering my 2nd trimester. My neurologists is working with my OB to make sure I’m taking the right medication. She told me that migraines with aura can become worse with pregnancy. It’s nice to know I’m not alone. Thank you for your blog. Just came across your post. I too am entering my second trimester and having aura/migraines also. It can be very discouraging.Between morning sickness and just feeling tired it is hard to cope with having visual problems and a headaches too. Does anyone suffer from thryroid problems also. Just wondering….if mine are triggered by pregnancy and thryroid disorder. Iam sure it doesnt help. I don’t suffer from thyroid problems, but I do have migraine with aura. I’m sure any thyroid problems you have may be aggravating your attacks. Are you being treated for the thyroid issues? Things change so much during pregnancy; I’m just crossing my fingers that the next week will be better than the last. Hopefully, this will soon be the case for you. Thank you very much for writing about your experiences of migraine in pregnancy – you are right, there is very little information out there, and what there is tends to be contradictory. I am in the UK, and health professionals here do not seem to be equipped to handle this issue. I have been very concerned because, since entering the second trimester of my pregnancy, I have experienced migraine aura every single day. Thankfully, it doesn’t always mean that a headache will follow, so I’m sorry to hear that you and others have such terrible pain. The aura itself is pretty debilitating though, as you must know. I become disoriented and I can’t really carry on with anything until it passes. The other day it descended really suddenly like a huge black fog of blindness, so unlike anything I had ever experienced before. Normally it starts with a pin prick of light and gets bigger and bigger until it covers my whole visual field. Anyway, I just hope that reading some of these details and your posts will help other women feel that they are not alone. Thanks again for writing your blog. All the best for the rest of your pregnancy. Thank you for your kind comments. I’m sorry you’re having to deal with daily migraine aura. I, too, am suffering from daily attacks, though they seem to alternate between presenting with aura and not presenting with aura. Of course, even after all these years, I still have a difficult time figuring out if I’m waking up with a new migraine or just the same migraine that was there the day before. So, it’s possible that the aura presents only for the new migraines. While it is tough to handle migraines (especially coupled with pregnancy), it is so nice to know we’re not alone. Thank you for reading! I hope you find some relief soon. What a wonderful blog you have. I live in the UK and came off my medications in January as my new husband and I wanted to try for a family and guess what? I’m now 3 weeks pregnant! However I’m not excited as I’ve felt so poorly with a migraine for 2 weeks (I know this is nothing compared to your sufferings). I’m off work sick and feel so useless and am losing hope I’ll ever feel better. It was so reassuring to read that you can’t think of yourself as an ill person – neither can I although I obviously am ill. I keep thinking I’ll wake up from this nightmare but I haven’t done so far. And regarding cleaning the bathroom, I feel exactly the same – I can see things need doing but summoning the energy to do it is a monumental task. Just reading of somebody else suffering makes me feel like I’m not so alone with this. Wishing you good thoughts and hope things improve soon for you. It’s been a long time since you posted anything? How are you?? Hi There, Thought I would add my experience in case it is helpful to others. I too suffer with migraines with aura. Generally I only get them a few times a year except when I am pregnant. In my first pregnancy I suffered a lot between 10 weeks and 22 weeks (but none after 24 weeks). I am now pregnant again, 15 weeks and have been suffering since I was 9 weeks. I am hoping that by 22 weeks I will be free of them again! I have also noticed that although my aura is bad, my headaches are not quite as severe as they were before I got pregnant – just a lot more frequent. I’m 24 weeks now, and I’m feeling significantly better. I do still get at least one migraine per week, but it’s summer in Texas so that’s to be expected. 😉 Still, I’m thrilled to be feeling so much more energetic and pain free. I hope you have the same luck come late second trimester. Wishing you a stress-free and joyful pregnancy. hello, i just came across your post here because i was looking for info on migraines during pregnancy. I feel like they have been becoming more frequent for me in my second trimester. or maybe that is because i am on my second one in 5 days. we are having a heat wave where i am, so i think that may be part of it. anyway, just wanted to send some sympathy your way. And i am glad to see that at 24 weeks you are starting to feel a little better. i am currently 22 weeks. The heat wave would certainly make mine worse. Summer heat is always a trigger for me – pregnant or not. I hope you find relief as your pregnancy progresses and the heat dies down. I just stumbled upon this blog during my search for answers about migraines and pregnancy. I JUST found out I’m pregnant- not even 5 weeks yet, and I already got my first migraine attack. I have had migraine with aura since I was around 14, but for the past 6 or so years I have found my miracle drug- amitriptyline. I have been taking 25 mg a day on and off (in the summer for instance, when I get migraines every other day.) and it has completely changed my life. My attacks are so bad that I lose the ability to speak… and it’s terrifying when it hits and I have to get home… and then the pain that follows is totally unbearable. Congrats on your pregnancy! I’m glad you have a neurologist who will work with you throughout your prenatal period. For what it’s worth, I think she’s right: the stress and pain of recurring migraine attacks are often more detrimental to mom and fetus than the medications used to control the attacks. (Though, of course, this is not always the case; it depends on the medication.) Here’s hoping you have a relatively migraine- and stress-free pregnancy! I cant tell you what a relief it is to read that i am not the only one suffering from migraines while pregnant. I am 24 weeks and have had daily migraines since 20 weeks. We are also in the process of moving into a new house and i feel horrible that i cant help, and when i do my sunglasses are on and all i can do is write on the boxes, telling the movers what room to put them in. I was getting upset because no one that i know had migraines like this. I was unsure what to do. My OB sent me to see a neurologist and sent me for a CatScan and bloodwork but came back “normal”. I am a teacher and have been out of the classroom now for 4 weeks. it is so hard for me to not be with my students but it would not benefit them for me to be in there in this condition. I have “given up” on trying to fight the migraines and work at the same time. i really hope they dont care into my third trimester. I am not myself and I feel i am missing out on “the best months” of pregnancy. i did find that swimming help calm me mentally as well as relax my body. I hope everyone has some time without a headaches and enjoy the moment of “clarity”. I’m so sorry to hear that you’re having such difficulties. My first and second trimesters were particularly trying for me. However, I did get some relief once I passed about 30 weeks. I hope the same goes for you. In the meantime, try not to feel like this is your fault or like you could be doing something better or more than what you are. You must treat yourself nicely – after all, it’s a hell of a thing you’re doing, growing a person. 😉 Relief will, hopefully, come soon. I feel for you and your wife. There are a lot of different medications and alternative treatments she can try. Unfortunately, everyone experiences migraine differently and there’s no real way of knowing what will or won’t work for your wife until you try a specific treatment. Does she see a headache specialist? If not, I recommend making an appointment. Abby, have you found some relief yet? Hi- as I’m laying in bed with yet another horribly debilitating migraine your short but accurate post made me cry. I feel defeated today – how can this be! Why hasn’t this pregnancy been the JOY I was hoping for? I just wanted to recommend you try REIKI – I found a practitioner near me that does it by donations and she’s seriously saved my life. Anytime I have a headache or migraine I go to her and hours later it feels better. I was at her place yesterday, and for most of the day was pain free, then got a chiro adjustment in the afternoon hoping that would help too, and woke up with a migraine…another one. My heart goes out to you as well. I’m 21 weeks and have had migraines from day one. I guess I’m part of that small statistic that doesn’t get a break. I just wish I had that break so I could focus on all the things I want to do to prepare for her arrival…I wish you a cold ice pack and better days my friend! I forgot to mention that Pedialite works wonders!!! Any time I start a migraine attack I down a whole container of pedialite and something a out the sugar and salt I that particular product often alleviates a great deal of the pain. I’ve gone to the ER about 4 times now since I started the pregnancy and they gave me an IV every time…often after two IVs my migraine would go from YIKES to OK I CAN HANDLE THIS so my hubby bought Pedialite to have at home. Try it!! It helps so much! I know this is an older blog post, but I just wanted you to know that I’ve come back to it several times reading the comments over again. I’ve had frequent migraines with aura since week 18 and now at 26 weeks, I’m home with another. I have had a couple 5 day spans without the aura (just with a slight lingering headache) but every time it comes back it tends to come back for several days at a time. I’m so thankful that others have shared their experiences here, as I haven’t found any other support/people going through similar experiences anywhere. I’m really hoping things improve in the third trimester. Thank you everyone for sharing. I’m sorry you’re having such a rough go of it. If it makes you feel better, I felt MUCH better after having my son. Even now, after 18 months of sleep deprivation and irregular meals, I feel pretty good. So, hopefully, you’ll feel better soon – if not in the third trimester, then after delivery. Hi. I am 26 years old and 14 weeks pregnant with my first. I too suffer from migraines and have for years and years. I hate feeling alone bc out of my whole circle of family and friends I dont know anyone who has migraine issues like I do. Therefore, I was wondering if you wanted to be my email penpal/support buddy? I just know how it is and I think being able to communicate with someone that is in the same boat can really help us both. We can just write to eo when we need support, encouragement, or just a friend to listen to us that can relate. Please let me know what ya think and hopefully we can chat more. After spending the last 4 days in bed completely disfunctional I feel a lot better knowing I’m not alone. I’m not crazy, this is real. I have a very very high pain tolerance, I have had 2 children without a drop of pain medication and am planning to do so again with this one but these migraine’s are going to be the death of me. Nothing I have tried even eases the pain in the slightest amount. I am ready to just throw my hands up. If u girl’s find any relief please let me know I’ll try anything that’s safe. Thanks for posting this it does help. Reading all these posts breaks my heart since I went through the same thing and was miserable. My baby girl is now 9-months and the migraines still come about once a week, but nothing like my second trimester. Here’s what’s worked for me: twice a week chiropractic care, coffee enemas on the onset of a headache/migraine (but I’m not sure these are safe to do while preggo I do them now that I’m not), take coconut water with added chlorophyl (this really helps as it’s Alkalanizing), drink one or two “green” juices that day (also Alkalanizing), drink tons and tons and tons of water that day, get an IV at the hospital (almost 99% of the time I had a migraine while preggo after one or two IV the migraine would go away so it could be dehydration or lack of nutrients), take a hot and cold shower where the water hits your head as you alternate the two extreme temps, and finally, get as much rest as you can. All these things combined are my go-to’s. I actually keep pedialite in the fridge and down about two of them when I get a migraine – this helps a lot. So sorry girls it’s so hard to be preggo or be a mom and have a migraine. I have a blog and talk more about my experience too if you want to read it: babykimsmommy.wordpress.com – sending prayers! I am so happy to have found these posts. I have had a Migraine for 3 full days now and really feel better knowing I’m not alone. I’m 24 weeks pregnant with twin girls💗 I have a rag with a couple drops of peppermint oil on it with an ice pack on my head now and it is giving me a little relief. Good luck to you all! Reading all these posts breaks my heart since I went through the same thing and was miserable. My baby girl is now 9-months and the migraines still come about once a week, but nothing like my second trimester. Here’s what’s worked for me: twice a week chiropractic care, coffee enemas on the onset of a headache/migraine (but I’m not sure these are safe to do while preggo I do them now that I’m not), take coconut water with added chlorophyl (this really helps as it’s Alkalanizing), drink one or two “green” juices that day (also Alkalanizing), drink tons and tons and tons of water that day, get an IV at the hospital (almost 99% of the time I had a migraine while preggo after one or two IV the migraine would go away so it could be dehydration or lack of nutrients), take a hot and cold shower where the water hits your head as you alternate the two extreme temps, and finally, get as much rest as you can. All these things combined are my go-to’s. I actually keep pedialite in the fridge and down about two of them when I get a migraine – this helps a lot. So sorry girls it’s so hard to be preggo or be a mom and have a migraine. I know my comment may not be read…..but I am glad and sad at the same time I found your blog. In my 18 week of pregnancy and I too suffer from Migraine with Aura. Idk how long thiabos gonna last but it is so exhausting…I get the blurred vision..the slurred speech…thebpins and needles from hands to arms to mouth. Had to take a Medical leave fore work cause it’s a constant battle and I wouldn’t be any good at work while in bad shape. Thank you so much for this post. Also was hoping to get any answers on how long the migraine will last?! Wish you all the best and will continue to pray and fight this batlle throughout my pregnancy!! Mine got worse in early 2nd trimester too! I had a reduction the first trimester. I find muscle relaxers work well for me when Tylenol with Caffeine doesn’t help. Flexaril is safe for pregnancy (category b). I don’t have aura, but reduced peripheral vision. Before I was pregnant, I took Relpax, but OB and neurologist did not recommend for pregnancy. Wow, I am so glad to have found this blog, I am 13 weeks pregnant with a history of migraines and since I’ve entered my 2nd trimester, they have gotten much worse. There isn’t a lot of info online regarding increased migraines during pregnancy, but plenty of info on decreasing migraines during pregnancy. I thought I was going crazy, such a relief to know that I’m not alone in this, I appreciate you all’s stories SO MUCH. It’s weird, this is my second pregnancy, my 1st was a breeze, I thought “I could do this all day” lol. No headaches, no nausea, just an easy pregnancy, but this one has been pretty overwhelming. I’ve been to the ER a few times for my migraines, they couldn’t give me too much, they did give me reglan which I don’t recommend, I had a full blown panic attack (they administered it through IV), very scary as I don’t want the baby to experience any stress. My ob gyn prescribed fiorecet, I’m picking up my rx today and I’m hoping that this gives me some relief. I know it’s been a while since this blog was started but I wonder how Sarah is doing, and how all the rest of you ladies are coping and if you’ve had subsequent pregnancies, how were your migraines for those. Thanks again for this, God bless you all. I’m so glad the blog resonated with you, Rebekah! My son is five now, with a seemingly unending supply of energy, but we’re quite well over here. Both of my pregnancies were very different so you aren’t alone there. I’m sorry you had a panic attack from the Reglan, but I’m glad your doctor is helping you find something that will work for you and be safe for the baby. I took Fiorecet in my second trimester, too. Be careful not to take it more than a couple of days per week, just because it can contribute to a potential medication overuse headache and you definitely don’t want that. However, I didn’t have any trouble with it, and it did bring me relief. I wish you luck and improving health! If you’re struggling with nausea, your ob gyn might also be able to prescribe you something for that. There is at least one that is considered safe during pregnancy. I wish you well!